1. Garlic – Garlic is one of the most powerful anti-microbial foods you can eat. It contains several components that will fight against yeast, fungus, worms and even candida overgrowth. 2. Coconut Oil – Coconut oil contains a medium chain fatty acid called lauric acid that lends coconut its antibacterial properties. 3. 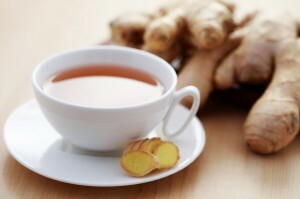 Ginger – The compound in ginger known as gingerol has been shown to help fight infections, specifically those in the mouth. 4. Fermented Foods – Fermented foods carry all of the benefits of their raw components, as well as the proactive antimicrobial component of probiotics. These good bacteria are a large part of your bodies defence arsenal. 5. Lemons – Lemons contain two compounds called coumarin and tetrazine, both of which can help fight against several pathogens. Lemons have protective effects both inside and outside the body. 6. Horseradish – Horseradish was known as an antibacterial food all the way back in the 1950s. It has been used to help treat urinary tract infections and lung infections and in Germany is known as one of the best anti-microbial foods you can consume. 7. Pineapple – Pineapple contains an enzyme called bromelain, which is helpful for digestion but is also anti-microbial. It has been used as a mouth wash to kill invading cells in the mouth and throat. 8. Turmeric - Turmeric has some of the most reliable scientific backing when it comes to its anti-microbial power. It has studies to prove its effectiveness against Bacillus cereus, Bacillus coagulans, Bacillus subtilis, Staphylococcus aureus, Escherichia coli, and Pseudomonas aeruginosa. The compound that lends the bright orange colour to turmeric is the same compound that gives it its anti-microbial power. 9. Honey - Honey was actually one of the first anti-microbial medicines the be used long before pharmaceuticals were around. Honey contains an enzyme that releases hydrogen peroxide, which effectively kills off certain kinds of bacteria. Make sure that your honey is raw and unprocessed. Pasteurized honey will not have the same effect. 10. Cabbage - A member of the Brassica family of veggies, cabbage has been used as a treatment for a plethora of ailments. It has cancer fighting properties, as well as a high vitamin C content which we all know boosts our immune systems and helps us to fight off foreign invaders. Cabbage juice is also an effective remedy for stomach ulcers. So next time you feel yourself getting sick, try adding some of these foods to your diet for a few days and see how it goes!